The transition from water to land is one of the most fascinating enigmas of evolution. In particular, the evolution of limbs from ancestral fish fins remains a mystery. Both fish and land animals possess clusters of Hoxa and Hoxd genes, which are necessary for both fin and limb formation during embryonic development. Denis Duboule’s team compared the structure and behavior of these gene clusters in embryos from mice and zebrafish. The researchers discovered similar 3-dimensional DNA organization of the fish and mouse clusters, which indicates that the main mechanism used to pattern tetrapod limbs was already present in fish. 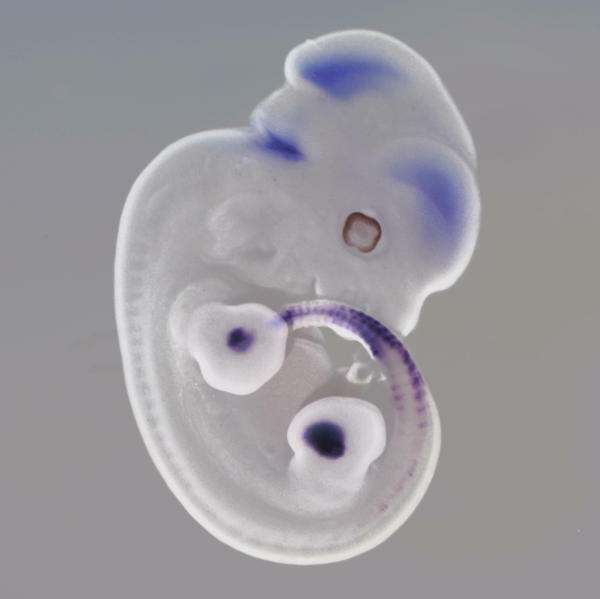 However, when inserted into transgenic mouse embryos, the fish Hox genes were only active in the mouse arm but not in the digits, showing that the fish DNA lacks essential genetic elements for digit formation. The study, published in the January 21, 2014 edition of PLoS Biology, thus concludes that, although the digital part of the limbs evolved as a novelty in land animals, this happened by elaborating on an ancestral, pre-existing DNA infrastructure.